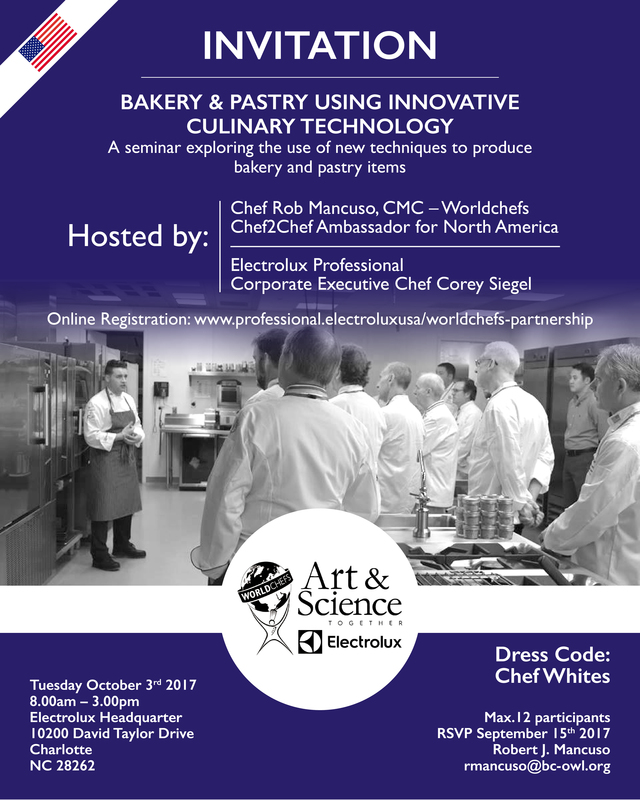 "Bakery & Pastry using Innovative Culinary Technology"
Arrival will be Monday October 2nd and departure will be after the seminar concludes. Electrolux Professional and WORLDCHEFS are pleased to invite you to a Chef2Chef training seminar as a part of their “Art & Science Come Together” alliance for 2017 . These workshops will educate chefs on implementing sustainable practices in the kitchen while maintaining high standards. The chefs will serve quality food, balancing a mix of Electrolux innovative solutions and the chefs’ creativity. In this session, we will explore the world of baking and pastry. This hands-on experience will go through freshly baked breads, custards, tarts, pastries, frozen desserts utilizing Cook & Chill technology (Combi Oven cooking and Blast Chilling techniques), Pressure Braising Pan and SpeeDelight high speed cooking methods. This session will open you up to easy and innovative ideas that can elevate your bakery and pastry programs.